symbolize life. When buds blossom into flowers, it represents a celebration of the renewal of life, which is the very core of christmas celebration. Christmas flowers are sometimes used as decorations in the wreaths, centerpieces, and Christmas tree ornament or as gifts in the form of flower arrangements, baskets and bouquets at christmas time. 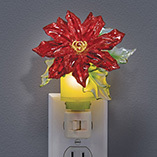 Flowers and greenery add interesting land festive look to the homes and fill us up with the christmas spirit. 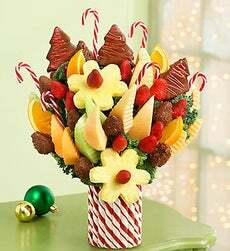 You can purchase several beautifully prepared christmas floral arrangements from the local flower shops or Internet retailers to gift them to the hosts of the christmas parties you are attending this year and also send them to the family, friends and loved ones who are not with you to share the joys of the christmas season or are out of town. Though christmas flowers encompass all the varieties of flowers including the tropical ones but still Poinsettias and christmas Roses continue to enjoy a special place in Christmas celebration because of the beautiful legends attached to them about this particular festival. Lets look at the significance of these flowers during christmas. 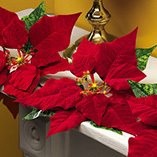 The poinsettia also known as Mexican flame leaf or Noche Buena is a sub-tropical plant known for its striking red displays at Christmas time. It is often used as a floral Christmas decoration because of its festive colors. Because of its bright, flaming red color and star shape, its popularly known as a "Christmas Star" or "Flame of Holy Night" in the United States. 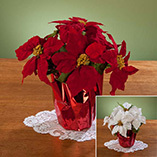 Poinsettias typically reach a height of 0.6 to 3 m (2 to 10 ft). The plant bears dark green leaves that measure 7 to 16 cm (3 to 6 in) in length. The top leaves are flaming red, pink, or white and are often mistaken as flowers. 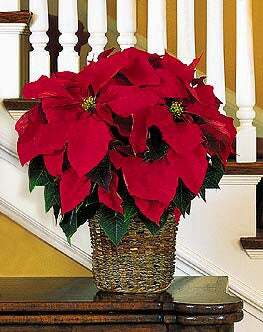 Poinsettias are native to southern Mexico and Central America, where they may reach heights of sixteen feet. Dr. Joel Roberts Poinsett, the first United States ambassador to Mexico, brought the plant in the U.S. in 1825 and thus named after him. 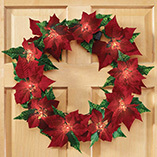 In the U.S. poinsettias can be found in the wild in Hawaii and Puerto Rico. This flower represents the deep love for Christ and great devotion of a pure innocent human being to baby Jesus. A Mexican legend explains how poinsettias came to be associated with Christmas. The devotees in the story were two beautiful, naïve children who were not so fortunate as their friends to have enough money to do what their heart desired for. These poor children from Mexico were known as Maria and Pablo, her dear little brother. Since Christmas has special association with kids, just like, they were looking forward to the Christmas festival and the annual Nativity play in which a large manger scene was set up in the village church. The season was full of parades and parties that were mainly centered around this church and all the people, especially children, used to gift presents to the baby child on Christmas Eve. Now, these two children loved Christ and the season of his birth very much. They desperately wished to buy something special for the baby Christ but dint have enough money to buy even simplest of gifts. They were unhappy and were quite disheartened by their poverty and misery when they set out for church to attend the service. They took the longer route in a dreamlike hope to find dome blossoms to gift the child but couldn't find any. They faced a lot of difficulties during their journey. But the hope and faith in the Christmas spirit kept them moving ahead. Finally, they picked up some wild weeds growing along the roadside as a gift for the Baby, squared their shoulders and approached the Church door. But how cruel little children can be, when they start teasing their fellow mates. Yet, Maria and Pablo braved their way to the manger and placed the greenery carefully around the manger. What happened next was the biggest surprise for all that were present! Bright red star-shaped flowers burst froth from the weeds and looked most sparkling of all gifts that the Christ child had received that day. A miracle had happened! The story demonstrates the warmth and the true nature of Christmas celebrations. A well-known English plant, the Christmas rose, is a true Christmas flower. as the name alludes it is deeply connected with the love, faith and devotion to Christ, The our Savior. This flower is believed to blossom in the snow-covered mountains of Central Europe in the depths of winter, often during the season of Christmas and thus, earns its merit as the true Christmas flower. Its botanical name is Helleborus niger. The flowers have five petals surrounding a ring of small, cup-like nectaries (petals modified to hold nectar). The petals do not fall as petals would, but remain on the plant, sometimes for many months. Although the flowers of its species may resemble wild roses (and despite some of their common names, such as "Christmas rose" and "Lenten rose"), they do not belong to the rose family. People often call this white flower with it's petals tipped in pink by the name of Snow Rose or Winter Rose because it flowers during the Winter season, surprisingly at the time when all the other greenery stoops down thickly layered with snow. There's an interesting legend, which demonstrates the aptness of its name as the Christmas Rose, with full certainty. It's believed that at the time of birth of baby Jesus in Bethlehem and when the wise men and shepherds were going to welcome the child carrying with themselves all kinds of gifts, a poor little shepherdess named Madelon saw them on their way. It was cold wintry night and she was attending to her sheep, when she viewed the procession of splendidly dressed Three Wise Men with their exclusive presents of gold, myrrh and frankincense rushing their way to little Christ. The group was followed by that of shepherds who were also informed by an angel of the birth of their Savior , laden with gifts such as honey, fruits and dove that were not so expensive and elaborate but expressed their joy and love. Out of curiosity, she asked them as to where they were going and also wished to greet the child but she was disappointed when realized that she had nothing to give to the Lord of the Lords, Jesus Christ! Even after her desperate search she wasn't able to find a single flower in the snow-covered fields and she felt so helpless that she started tears. An angel saw her this way and was generous to transform her love for the Newborn Christ into a Christmas Rose, which she found to her joy, buried deep in snow, and carried it to the child. That's how the Christmas Rose became symbolic of deep Christian faith and devotion and symbolizes Hope.